Kagekiyodō is the cave named from lore of a samurai general “Kagekiyo”. He was defeated and retreated into the cave about 800 years ago. The highlights of the cave were the beautiful walls and ceiling as if some patterns are engraved, and fossils of corals and others. Trying the adventure course is highly recommended. You will proceed to the dark, inner part of the cave relying just on a flashlight. 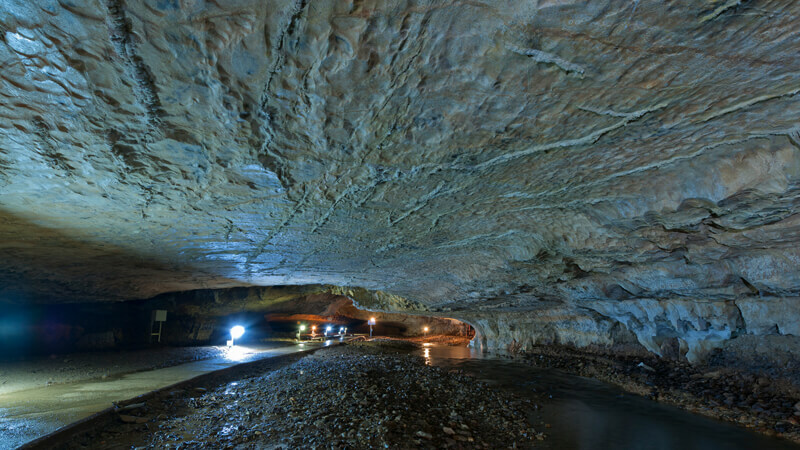 A camping site and a hot spring facility are located right beside the cave. ADVENTURE COURSE -Add ¥300 to the entrance fee. -The ¥300 includes the rental fee for a helmet, flashlight, and rubber boots. ※The person in charge needs to present the passport at the time of ticket purchase. ※Group discounts only.Discounts on individual travelers were abolished from April 2019. Adventure course: plus ¥300 to the above entrance fee.